The Heavy Combination is with one trailer attached of more than 9 ton. 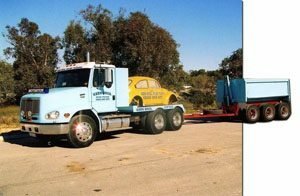 We provide both truck and trailer in either auto, synchromesh or road ranger and semi options. You will learn how to conduct comprehensive pre-trip and mid-trip inspections as well as reversing a truck and trailer combination. You will also learn how to climb and descend steep hills. You must have held a C class (car) licence for at least 3 years and Medium Rigid or Heavy Rigid licence for at least one year. KeenBros not only do all the training for this licence, but they also do the assessment. The Multi Combination are the multi trailer giants of our highways. You will be either driving a B-Double, or a Road Train. You will learn how to conduct comprehensive pre-trip and mid-trip inspections, as well as reversing a truck and multi trailer combination. You will also learn how to climb and descend steep hills in a very large vehicle.